Christopher Nolan - even the most laid back film fans will be no stranger to this name. Arguably one of modern cinema's most famous filmmakers, Nolan has tackled numerous genres and given birth to some of the most innovative blockbusters in recent times; be it the acclaimed reboot of DC Comics' Batman in the form of his Dark Knight Trilogy or the mind-bending sci-fi flick Inception, something always referenced when referring to the need for more originality in the summer movie season. Now the man returns with his latest summer hit, Dunkirk, a retelling of the renowned evacuation within the midst of the Second World War. 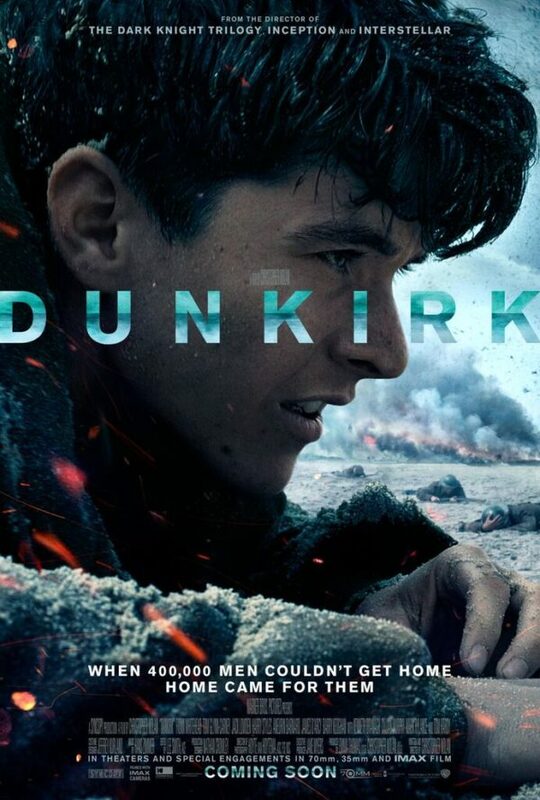 Not unusual for Nolan is the concept of narratives with multiple threads, and Dunkirk is not exception: the story follows three key segments of the eponymous event across the land, air, and sea. Within land, Tommy (Fionn Whitehead) finds himself under threat alongside thousands of other soldiers as they seek to return home from the compromised French town, whilst at sea the likes of mariner Mr. Dawson (Mark Rylance) venture to the thousands of soldiers of who find themselves stranded and without hope of rescue. Intertwined with this is of course the air, featuring Spitfire pilots lead by Farrier (Tom Hardy) fighting off the German armada whilst the rescue below continues with great difficulty. What makes this branching narrative pattern work well is that, whilst it can sometimes make character development an issue, it actually helps render the film as a sort of reenactment of the event and not an overly sentimental adaptation of it. We aren't treated to onslaughts of hefty backstory and it's clear not too many liberties have been taken within the creative process; instead, what we see is grim and down to Earth, not reaching the likes of Saving Private Ryan in terms of visual intensity but still giving birth to some extremely tense and gripping scenes, many of which also catch audiences off guard and so make the thrills all the more impactful. A strong cast also helms a number of superb performances. Solider Tommy is sometimes a tad underdeveloped, but the genuine fear yet determination Whitehead demonstrates within his performance helps us relate more to the overall struggles such troops must've been forced through - the same can be said for the supporting cast and extras surrounding him, and of course for the likes of Rylance, Hardy, and of course Kenneth Branagh in their surprisingly powerful roles. Their acting ability flourishes more than ever to bring even more life to an already smartly written script. Nolan also remains a fab visual stylist, of course - overall the aesthetic perfectly replicates the time period and once again helps understand just how hellish some of these experiences must've been. Dunkirk is a brilliant watch from beginning to end, and while not without flaws in instances of some sluggish pacing and mediocre development, it remains an exciting yet also thought provoking war film that shows yet again how Nolan is an expert of his craft.